Green pastures overlooking the bay, crowned by Mount Rainier and lights of Seattle in the distance. 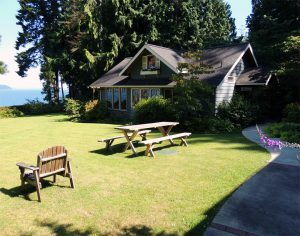 The sea, a beach, and an island… one of Whidbey Island’s finest romantic bed and breakfast cottages. Imagine yourself in a hot tub, just after dark, with your loved ones, gazing across the sound at the city lights & up through the trees into the starry sky. Enjoy a roaring beach fire in the fire pit out on the beach right in front of the house. We have the graham crackers, chocolate and marshmallows ready for s’mores! 5 rooms – Kids and pets are welcome. 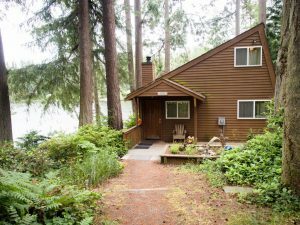 Goss Lake View Cabin is a charming private home nestled in tall cedars on the shores of beautiful Goss Lake – at the end of a quiet private road, on a bit of a bluff. 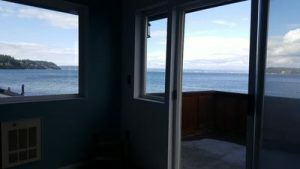 Lovely lake views from living/dining room, kitchen and upstairs bedroom and from the ‘always-hot’ hot tub. 2 rooms – Kids and pets are welcome. 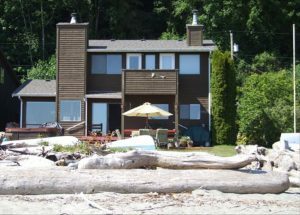 On the beach at Useless Bay, surrounded by a wildlife sanctuary — an uninterrupted view of water and mountains, an expansive beach at your feet, a peaceful & generous seaside escape. 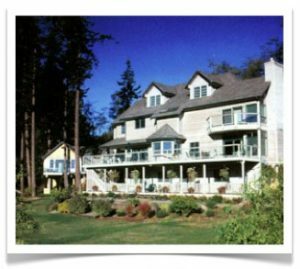 Island Getaways are 3 distinctive properties each with its own uniquely Whidbey experience. Island Penthouse is a luxurious romantic getaway for two. 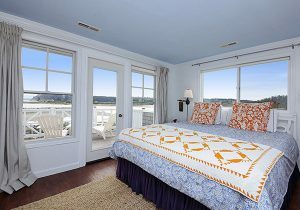 FabView Getaway is a private cottage for either couples or families. FabView II is a secluded home for 2-10 guests with more than an acre of room to roam. A unique vacation home decorated with art, crafts and music by Northwesst crafters. 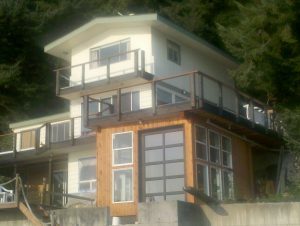 It is a cozy 800 sq ft home with 1 Private Bedroom, Separate living area in loft with hide a bed couch, and private deck. Expand on your living space with many outside amenities. 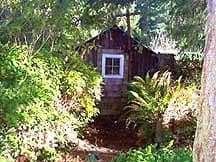 Located on the south end of Whidbey Island in the Puget Sound, the Pine Cottage and Chalet is perched above Saratoga Passage and embraced by tall cedars. The property offers inspiring vistas of water and the Cascade Mountains – Pilchuck, Glacier Peak, Mount Baker and the Three Fingers are all visible on clear days. This is a rustic 2 bedroom 1-1/2 bath home that accommodates 4-5 adults or a family of six comfortably. We work hard to make this beach side experience turnkey so you only need to bring your food, clothing, and toiletries. 1000 feet to the north is a public boat launch is available at Possession Beach Waterfront Park. 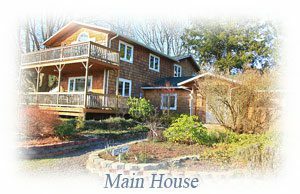 From bucolic to waterfront, we have the cottage or studio to suit your vacation getaway. Each of our 4 get-aways is a private and self-contained accommodation with its own special amenities. 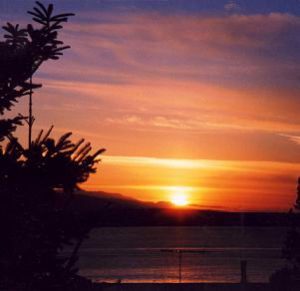 Spectacular sunset views of Admiralty Inlet, the Olympic Mountain Range and the shipping lanes of Puget Sound. 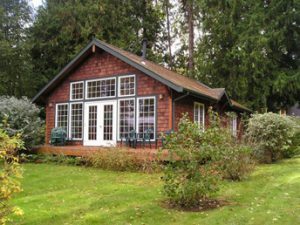 This lovely secluded 2 bedroom heated cottage is nestled on 22 acres of enchanting evergreen and cedar woods, pastures, meadows and gardens with beautiful walking trails. It offers ultimate privacy and open, light pastoral views. 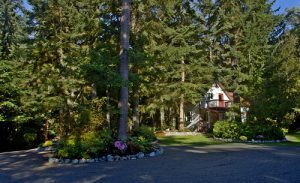 The cottage is beautifully furnished, fully carpeted and has a TV and VCR, a cozy woodstove, and a beautiful deck. A Cottage and an Estate – for couples and large groups. The Quintessa is a quintessential home for your Wedding, Family Reunion or Retreat! Perfect for 2 at our romantic cottage. 32 under one roof at the estate, 10 bedrooms 5 baths. You can even rent the entire estate! Year-round creek, pond and trails. Breathtaking views.